The original Shaqnosis designer tells us the never-before-heard full story of how Shaq's most iconic shoe came to be. It's not often that a designer sits down and sketches out what will become an iconic and era-defining look in one crack. 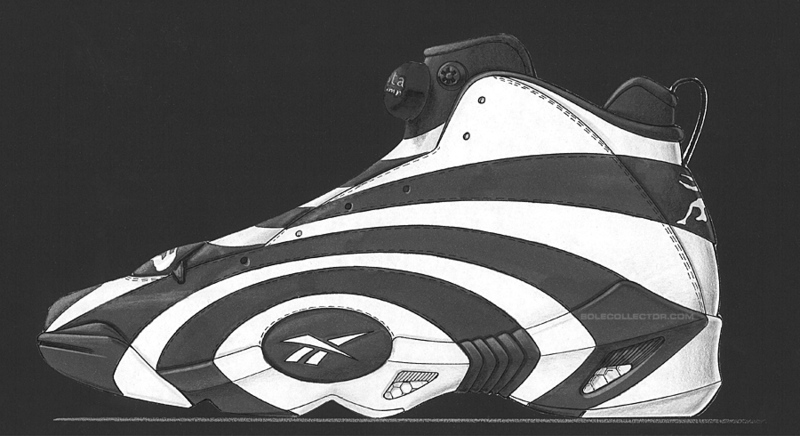 As the original designer of the Shaqnosis, Reebok Senior Designer Jonathan Morris reveals, his initial sketch wasn't actually even intended to be a sneaker for Shaquille O'Neal, but the powers that be at the brand knew just how strong and bold the concept was. They knew how polarizing the sneaker would be, and as was often the case during the 1990's, brands were willing to actually take a risk. 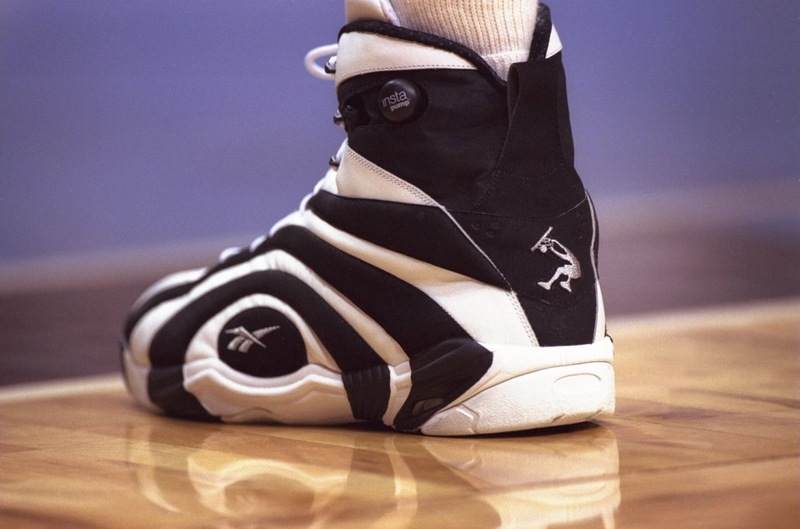 To hear all about what was actually an advanced concept design that then became the Shaqnosis that we all know and love today, Jonathan Morris takes us back to January of 1994 in this exclusive interview to recount the powerhouse meetings led by then-CEO Paul Fireman. It was during those meetings that the design language of the brand throughout the decade would be shaped and defined, and while he didn't initially know it at the time, it was Morris' bold and aggressive aesthetic that helped to spark the era. Nick DePaula: Tell me a little about your background at Reebok and some of your earliest designs at the company? Jonathan Morris: I started at Reebok in 1989, and the design department was pretty small with just seven or eight designers. Paul Brown did some amazing shoes and was the head of the department. I started out working on tennis shoes and did the Pump Victory 2 for Michael Chang and the Pump Low for Michael Stitch. I then started doing all of the outdoor category, and I did the first Reebok outdoor sandal, the Amazon, which was millions of pairs. I did the Cliffhanger, which was a cool shoe and kind of a cross between a mountain climbing shoe and a street casual shoe. It was a really unique silhouette for the time and was a great shoe because they couldn't make enough leather for it, and they had to get like five tanners to produce enough leather to keep up with the demand. I also did the Kamikaze II, and that was a really hard shoe because the previous shoe was so amazing. I was really impressed with that design, and it's really tough as a designer to make a shoe that's going to follow up something so iconic, and try and improve upon it and not let everyone down. [laughs] It was pretty neat, and I just made something really aggressive going up and down, which was basically the direction. We wanted to make something really unique to match the characteristics of Shawn Kemp's game, and because the first shoe was such a dramatic upper, it came pretty quick. Reebok just brought those back out, and the only difference of course is that it doesn't have the Kemp logo, which is something Reebok can tell you about I'm sure. [laughs] I actually have a signed pair of the Kamikaze II right here on my desk, which my good friend E. Scott Morris gave me. He used to be a designer here, and we used to drive in to work together actually. I kept that shoe all this time right at my desk. NDP: During the early 90's, you had the Above The Rim era and then an entire new design approach came about toward the mid-90s – how did those conversations about doing something different and shifting the design language begin? JM: It just kind of happened organically within the company actually. We were all under Paul Brown, and we had some new designers, like Nick O'Rourke, Fiona Adams and Steven Smith, who I can't say enough about. Steven did the Fury, and is just an amazing designer. It was really organic of the period, and Reeboks were really aggressive and bold at the time and really fun. 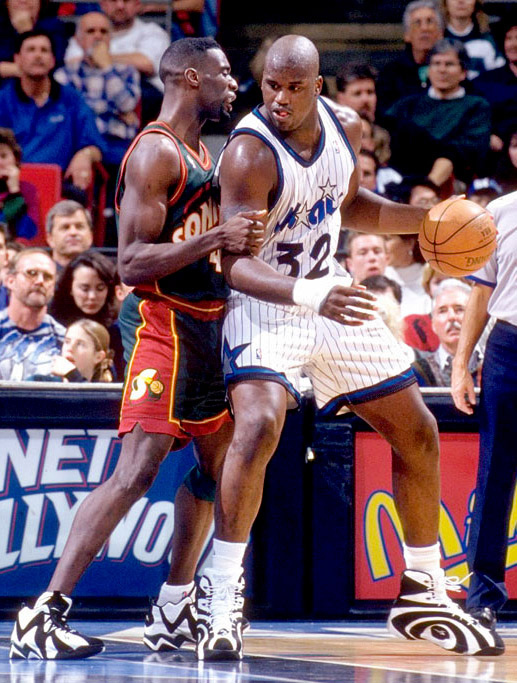 I wasn't really designing the Shaq shoe at that point actually. E. Scott was actually designing the Shaq shoe for that season, and I was doing a shoe within advanced concepts that was focusing on a custom cushioning system. I had this fairly typical wavy pattern, with ellipses, and this was back in '94. Because the technology was happening in the footbed, I had this kind of oval shape right in between the midsole and upper at the midfoot. The design didn't really go over too well. [laughs] My friend Steven said, “Come on, lets push it.” I said, “Ok,” and I was really thinking about cushioning, expansion and a ripple effect, like when you throw a rock in a pond and then the water all expands around it. That gave me the idea of this cushioning system expanding and these concentric rings, and I did a sketch around that. That was my idea, and I just colored it in black and white. Maximum contrast is what they always tell you to do in art school. [laughs] Maximum contrast will get the attention of the viewer. So it was black and white, and we had a meeting in design with different designers, product marketing people and Paul Fireman, the CEO. Paul was pretty involved with the process, and when they showed him the sketch for this cushioning concept update, his eyes got real big. He said, “Well, can we make a shoe like that?” I said, “Sure we can.” He said, “What we should do is, we should make that the Shaq shoe, and E. Scott's shoe that he's working on for Shaq, we'll make that the NFL shoe for Emmitt Smith.” E. and I looked at each other right away, and we had a huge mutual respect and I just said, “Well geez, I don't want to take a project from you.” [laughs] He was really happy though, 'cause he loves football too. I was really excited because all of a sudden I was designing a shoe for Shaq, and everyone loves Shaq because he's really a good guy. So we just looked at each other and both smiled, and I took that sketch and the only change I made was I put the Dunkman logo on the back and then I designed the bottom. What was kind of neat, is I've heard some people say it's the ugliest shoe ever, and some people think it's awesome. That's really cool, because if you get a passionate response, then you're doing your job. If people say, “Yeah, it's ok,” then that's not too exciting. That shoe really had a nice 360 story, and it was pretty cool. NDP: I talked to Shaq a few months ago, and he talked about the story of how he named the shoe. How do you remember the name coming about? JM: I guess I don't remember. [laughs] Lets go with his story. [laughs] But I've got three kids and a picture of them with Shaq's size 22 pair and their own, and it's really funny because I designed the shoe, but I also designed the junior size, the kids' version and the crib shoe. Typically, that's not how it works. The designers in the Kids group would do it, but I asked, “Can I take this down?” I learned from them how to simplify the pattern and what kinds of materials to use for an infant and child, and it was really fun. It was great for Reebok and for myself to have an opportunity to work on a shoe like that, something that was so iconic and means a lot to different people. It's definitely something that will always stand out and it's very cool. NDP: What do you remember from a performance standpoint that you guys had to focus on in the shoe to make sure it could perform for Shaq's size & frame? I remember his size 22 version being a bit taller. NDP: The crazy thing with the Shaqnosis was there was just ONE color. Did you guys discuss doing any other colors originally, and which ones if so? JM: Not originally actually, but I do remember Paul Brown bumping into me in the hall once after they had come out, and he said, “We should've done some silver and greys.” I remember him talking about doing a silver one, and I don't really know why they never did any extra colors, but I'm just glad they did the shoe. [laughs] That was a big commitment for Reebok. When you come up with a shoe that's really bold, and it was fairly polarizing, luckily it turned out well and I really like it. I look at it now and wonder what I'd change. NDP: I was going to ask about that. Luckily the lines all lined up, but is there anything else you'd change looking back at it? NDP: How involved have you been now that they're bringing the Retro version back? JM: Actually, Paul Smith in the Classics group is another tremendous designer and I actually brought in my original size 9 sample to help them remake the shoe. I didn't want to bring in my size 22, 'cause I was a little worried about getting that one back. [laughs] But as you probably know, we didn't have any of the original outsole toolings or anything, so they had to use the sample to work on the tooling and help with the pattern. That was my only involvement, was nervously handing over my original sample. [laughs] The Classics group did a great job with the new one. NDP: Have you been able to see any of the new colors that Reebok is coming out with, and do you have a favorite among the new batch? JM: There's a red and white one that I like, and also the silver one I thought was pretty cool. I also like some of the new Kamikaze colors too, like the All-Star gold and red one. There's a really great group of people in the Classics group that did a great job of bringing it back. We had so many great people at Reebok when we made the shoe originally, and it was a lot of work by a lot of great people. NDP: Do you remember watching Shaq on TV or in person back then, and having a moment where you saw the shoe on-court for the first time? JM: I saw it in a couple basketball magazines at the time, and I remember just thinking, “Man, that's too cool!” Even today, if I see somebody wearing any of the shoes that I've designed, it's still really cool. That's one of the best parts about being a designer, and I always encourage young men and women going to school for product design to really cherish this, is that footwear is great because you really get to see your products come to life and be worn around. NDP: Do you remember anything in particular from your time working with him on the shoe? JM: Nothing really from when we worked on the shoe, but I do remember when he was on MTV Cribs. I don't want much TV to be honest, but I did see the episode that he was on. He walked into his closet, and he pulled out the Shaqnosis and he said, “This is my favorite shoe ever,” and then he kind of moved it around in a circle. [laughs] I'm just real happy he liked the shoe. 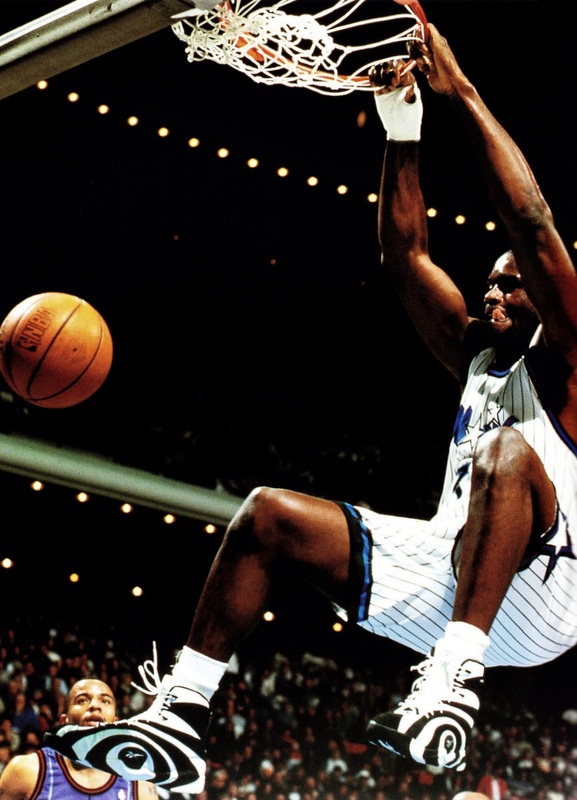 NDP: That's great to hear, and for me personally, the Shaqnosis, Kamikazes and Blast are right at the top as some of my favorite shoes of all time, by any brand. JM: That sketch that I did for the Shaqnosis, as just a real strong black and white shoe, really inspired the whole collection. It was Paul Fireman's idea, and he said, “Lets do a whole collection.” I don't know who came up with the name “Mobius,” which is a single strip that looks three-dimensional but is actually just one side that you can twist and connect. Dave Prescott did the Big Hurt, there was also the Blast, and Fiona Adams did the women's training shoe. There was also a soccer shoe, and it became a collection for the brand. I think that was really unique for the industry, and it was another Reebok first, to take a collection across all categories. It was a real proud Reebok moment, and it was different thinking. I know for some of the younger designers at Reebok, they've all been really excited about these shoes, and that's been a great feeling for me, so that I don't feel so old. [laughs] It was a great time when we worked on this collection, because there were a lot of people that had a lot of desire. I was challenged to step it up, and I think I did, and everyone at Reebok had the same attitude.